This is the sound of Joe Henderson’s 22 alaskan malamutes howling with total abandon. 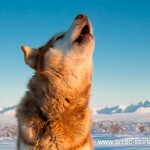 They love to howl when they have been fed, or pretty much any time they are feeling happy and content. I like the sound too, it’s like canine ululation, an ancient sound that unites all the individuals as a pack and raises the hairs on the back of my neck. Listen carefully and you can hear all their voices, the high, the harmonious, the low and hoary and the darn right mournful. Moments of perfect harmony phase in and out as they find their collective voice. 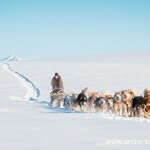 It’s a sound that travels for miles around and broadcasts their collective pride and presence – If I were a passing wolf I would be seriously challenged by this choir! 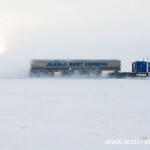 My previously posted video, At home in the Arctic, of Joe Henderson’s alaskan malamutes in a ground blizzard has generated a lot of interest and amazement, so here’s some further shots. 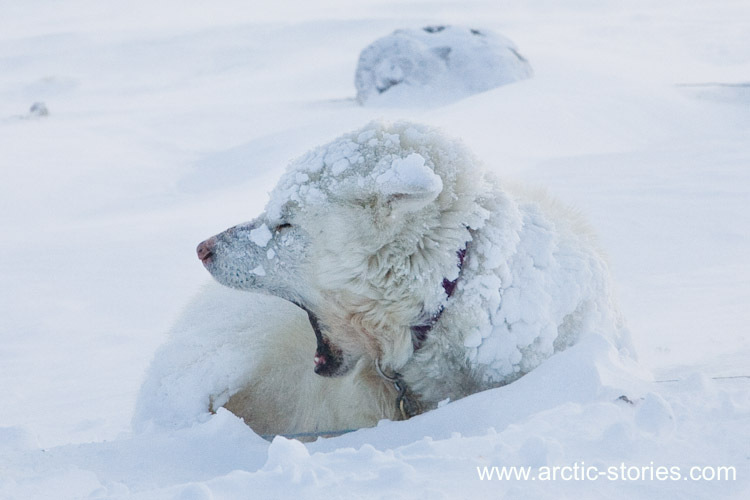 For a dog with an Arctic pedigree bedding down in a storm is the most natural thing – curl up, wrap that bushy tail over your nose, stay very still, soon you’ll be cloaked in a warm and insulating coat of snow. it’s time to stretch and shake off. Leading on from my last post about bad weather I am always impressed and a little bit jealous of Joe Henderson’s blizzard coat. When the weather gets really rough, on goes the coat. 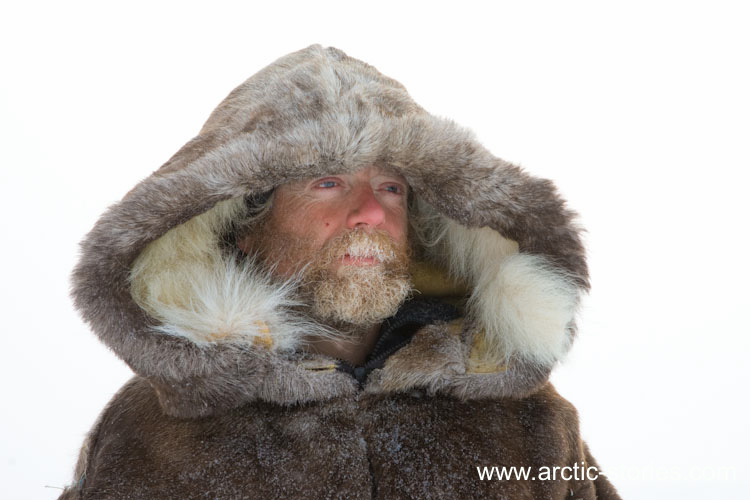 It’s warm, it’s windproof and most importantly it’s breathable, it’s beginning to sound like it is made of a modern “wonder” fabric but, as you can probably see, it is made of caribou fur. Joe hand sews them himself the traditional way and the extra long parka style makes a lot of sense for walking in a blizzard. Most insulated jackets that you might buy are cut short leaving your backside and all important thigh muscles exposed and having cold muscles is going to sap your energy fast. 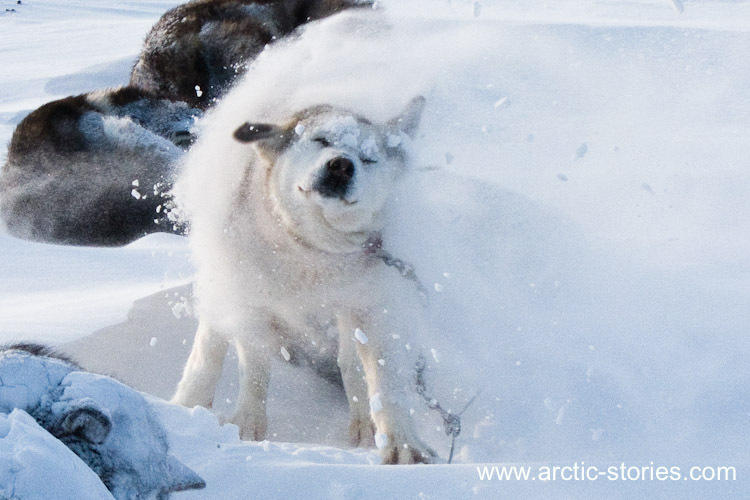 The Arctic coast of Alaska is famed for its weather and not least it’s wind. 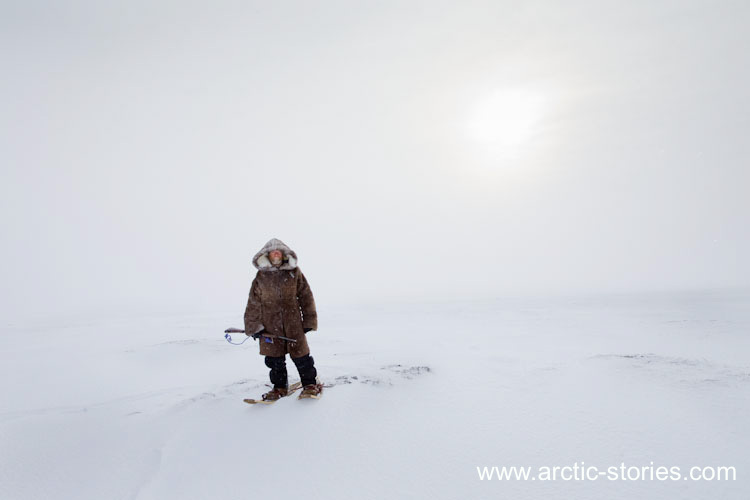 On my first trip to the Arctic I travelled along the coast on a short trip with Joe Henderson and his dog team and we encountered a lot of wind, wind that kept us tent bound for days. Everything was new and the wind was exciting. 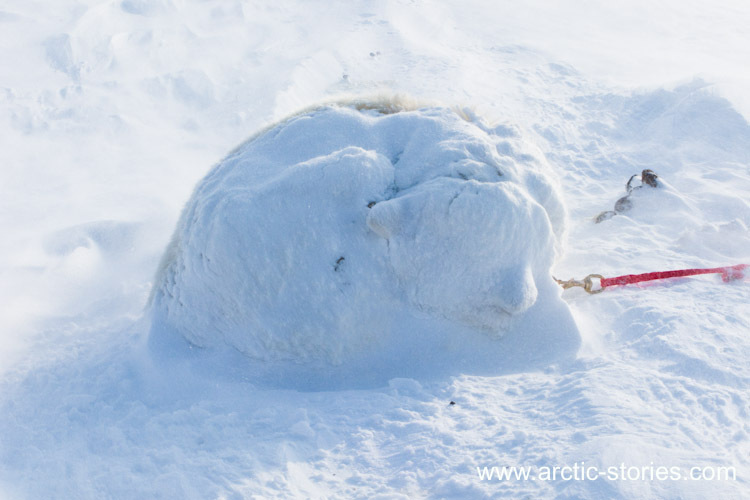 It scoured the surface of the sea ice and deposited great drifts of snow across our camp and over our tents. All the time we were snug and warm in our tents with a plentiful supply of driftwood to burn and food to cook on the stove. Outside Joe’s dogs slept and I could not believe what I was seeing. 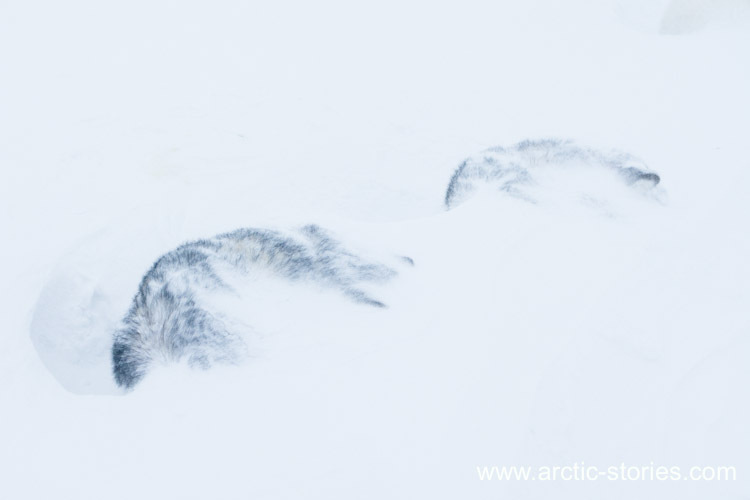 They had bedded down on the ice, curled their noses under their tales and let the storm blow over them. 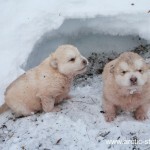 Soon many of them were drifted over sealed under an insulating quilt of snow, content and protected from the ferocious windchill. But don’t just take my word for it, as the storm abated I shot some video footage. 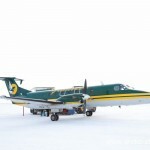 The northern lights in Alaska are undoubtedly spectacular, they often swirl and dance across the night sky adding an unworldly charm to many of our camps, at least that’s how I like to think it is because in reality I have very rarely seen them. 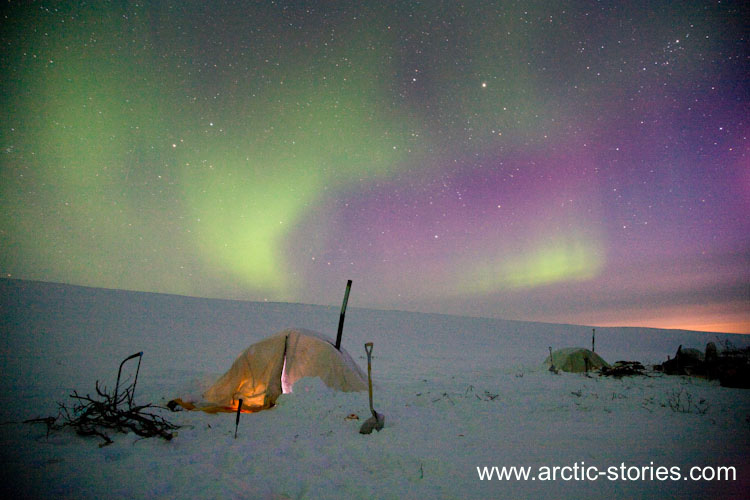 In the depths of March a clear night means a cold night and it takes a lot of determination to leave the cocoon of a warm sleeping bag. On this occasion I did, I set my alarm for 1am, staggered up, pulled on mukluks, parka and mitts, stepped outside and was mesmerized. It was a revelation that I will always remember. The only problem was that I’m also a photographer and I’m meant to photograph things like this, often I would really rather kick back and enjoy the moment. The thought of setting up a camera and tripod to record something so ethereal seemed a little distracting and practically challenging. Fortunately habit kicked in and I took this photo, maybe not the best shot ever but it has become a talisman for me, representing much of what draws me back to the North year after year. I risk sending myself up here a little, but since I started travelling to the Arctic I have grown a beard. It might look the part to my friends and they might also reason that it has the practical advantage of warmth. They are probably right about the romance of the look but I’m definitely not sure about the practical advantages. 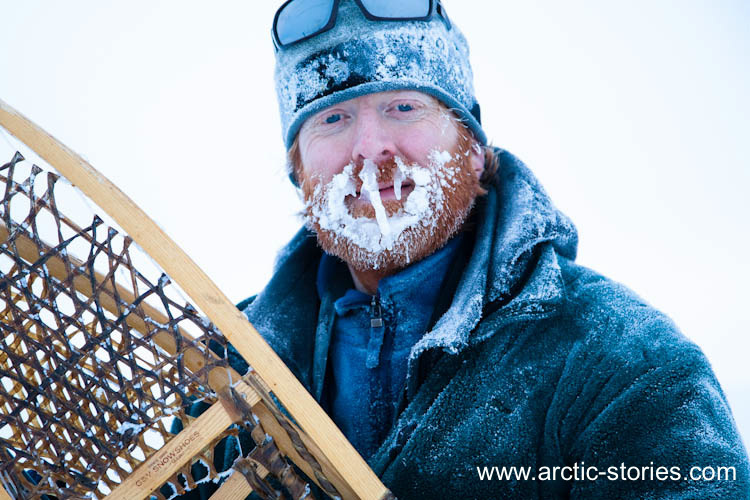 This is me after a day of snowshoeing at -30 and as you can see the moisture from my breath has turned to ice on my beard, the longer the day the more the ice grows (not to mention unseemly snotsicles) and you have to seriously be careful that your mouth doesn’t freeze over, no joking! Every now and then it’s a good idea to snap the worst of it off or even gnaw your way out with your teeth. I can’t help thinking it might be less trouble to be clean shaven.